My grandmother had amazing collections from her travels, everything ranging from beautiful seashells to thousands of arrowheads. She was a cool lady that had an eye for interesting and unique artifacts. 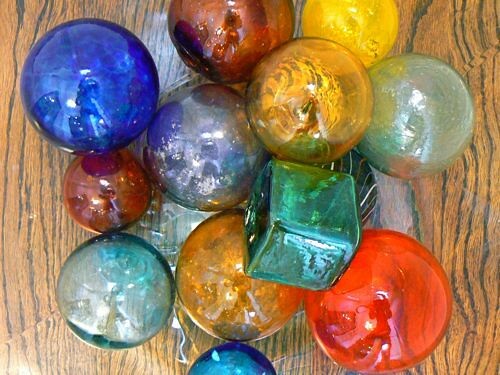 I’m lucky to now have bits and pieces of a few of her collections, including her assortment of antique glass floats. These floats were tied into nets by fishermen in Japan and Norway to keep their nets afloat. 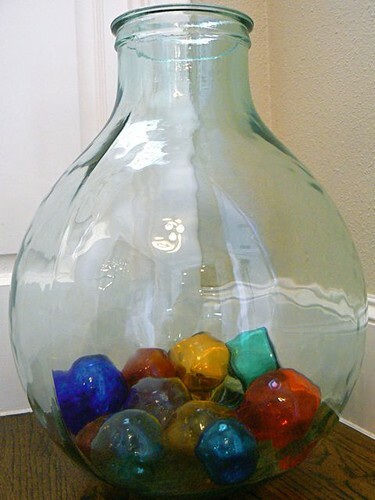 I tried to wipe them down before placing them in the vase, not realizing that the sand was ground into the glass after years of floating at sea. Now that I’ve realized that, I’m really appreciating the journey these little guys have taken. A few of the floats even have some seawater inside of them, trapped after seeping through microscopic holes in the glass! I like that they give our guests a cheerful greeting at the front door. I only wish that more of them would fit through the mouth of that vase! This post is shared with Fireflies & Jellybeans, Tales from Bloggeritaville, Remodelahics, Poppies at Play, Finding Fabulous and My Romantic Home. How cool is this!?! I love it that you are decorating your home and also paying homage to someone you loved. How would it work to put in some white sand or even white kitty litter (gasp!) to make the gorgeous colors stand out from your wooden floor? I also thing the larger container protects the fishermen’s floats while still showing them off. I really like it when people incorporate things that have meaning and value to them into their homes as you have! They are absolutely gorgeous. So full of color, and history! What a great addition to your fantastic home decor! I love all the colors! Things That Inspired featured Japanese glass fishing floats not long ago and I’ve been smitten ever since! Where do you think I could find them?! 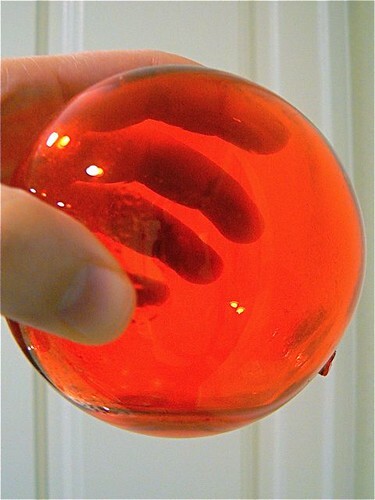 Some offer vintage glass floats, and other offer reproductions. Hope this helps! The colors are truly beautiful! I love them! I agree – what a great way to greet your guests! As always, great blog!! those are very beautiful! 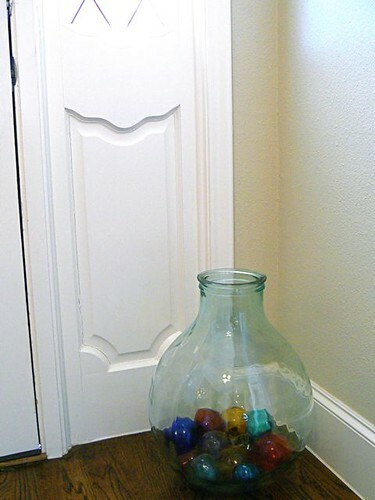 What a fun thing to have in your entryway! 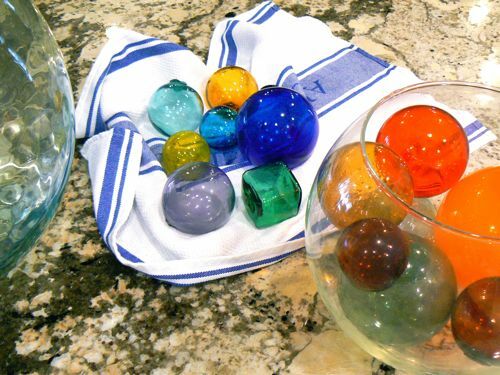 What a wonderful collection of glass floats…the colors are so vivid for being in the water for so long. Is there a reason for the square ones versus the round? Thank you for sharing. That would be a very cheerful greeting! How fun!! I would love to get my hands on some of those! How awesome that they are a family heirloom of yours! Love this, and I especially love the huge jar they are in. Beautiful! Hope you come back for this week’s party!